- As noted, it was announced on last night's RAW that Ronda Rousey will make her WWE video game debut in WWE 2K19. She will join Rey Mysterio as the pre-order bonus Superstars. 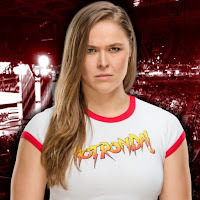 NEW YORK--(BUSINESS WIRE)--2K today announced that Olympic medalist, feature film actress, UFC® Hall of Famer and current WWE® Superstar, "Rowdy" Ronda Rousey®, will make her WWE console video game debut in WWE® 2K19, the forthcoming release in the flagship WWE video game franchise. The "Baddest Woman on the Planet" – who put the WWE Universe on notice with a surprise Royal Rumble® 2018 appearance, blockbuster WrestleMania® 34 debut match and continued explosive presence – will appear in WWE 2K19 as a playable character wearing her signature ring gear inspired by "Rowdy" Roddy Piper. In addition, 2K's global marketing campaign trailer for the announcement, which debuted during last night's Monday Night Raw® broadcast, further celebrates Ronda's landmark WWE arrival and incredible bond shared with the late WWE Hall of Famer through inclusion of Piper's verbal praise from her Piper's Pit™ podcast appearance in 2015. "As a WWE Superstar, having support from the Piper family means everything to me," said Ronda Rousey. "It's an honor to be part of WWE 2K19 and have my name mentioned alongside so many important Superstars in WWE history, including Rey Mysterio, Kurt Angle®, Ultimate Warrior®, Sting™ and Goldberg™." "Anybody can call themselves 'Rowdy', but it takes a special, talented and dedicated individual to live up to the 'Rowdy' name," said Colt Toombs, son of "Rowdy" Roddy Piper. "My dad saw it in Ronda, and so do we. She is truly 'Rowdy to the core,' and that mindset really comes through in the trailer for WWE 2K19." Rousey, alongside former WWE Champion Rey Mysterio, will be available as bonus content for those who pre-order the game at participating retailers for the PlayStation®4 computer entertainment system, the Xbox One family of devices including the Xbox One X and Windows PC. WWE 2K19 is currently scheduled for worldwide release on October 9, 2018, with Early Access players receiving their copies and in-game bonuses beginning four days early on October 5, 2018. "From an Olympic tatami to the UFC Octagon to the WWE ring, Ronda is a one-of-a-kind athlete and incredible ambassador for career and life empowerment," said Chris Snyder, Vice President of Marketing at 2K. "Her discipline, determination and attitude toward accomplishing her goals and silencing her critics make her the perfect embodiment of WWE 2K19's 'Never Say Never' global marketing campaign. We are thrilled to welcome Ronda to the WWE 2K family and can't wait to see what's in store for her in the years to come." * Access to WWE 2K19 Collector's Edition digital content (details announced this summer). * Limited Edition WWE® SuperCard content. Developed collaboratively by Yuke's and Visual Concepts, a 2K studio, WWE 2K19 is not yet rated by the ESRB. WWE 2K19 is currently scheduled for worldwide release on October 9, 2018 for the PS4™ system, Xbox One and Windows PC. For more information on WWE 2K19 and 2K, visit wwe.2k.com, become a fan on Facebook, follow the game on Twitter and Instagram using the hashtags #WWE2K19 and #NeverSayNever or subscribe on YouTube. For more information on the WWE 2K19 Million Dollar Challenge, please visit wwe.2k.com/milliondollarchallenge/rules. - Weekend WWE live events saw Ronda Rousey, Nia Jax, Ember Moon, Bayley and Natalya defeat RAW Women's Champion Alexa Bliss, Mickie James, Liv Morgan, Sarah Logan and Alicia Fox in ten-woman matches. WWE posted this video of Rousey and Jax getting along during the match.